This whole "spring forward" thing had me more than a little confused this AM. After going to bed fairly early last night (11PM, woaaah buddy), I was shocked to see that my body allowed me to sleep until 8:30AM. Sleeping in has kind of become a thing of the past for me - my body is unfortunately now used to being up at the crack of dawn. So, I was pretty impressed with my 8:30 accomplishment this morning, until I realized it was actually 7:30AM, and my iPhone had just taken care of the whole "spring forward" thing for me. Anyway, I was up and ready to go, so I went outside to check out the weather (it was GORGEOUS yesterday and I was hoping for a repeat today). I went to the kitchen to get the coffee ready, only to find that we had just enough left for a cup or two. So, I decided to make a coffee run to my favorite Dunkin Donuts just down the street. Two cups of coffee and five muchkins later (had to do it! ), I was on my way home to wake up my fiance for the day. I took down a few of the munchkins while I was making up some eggs. Eggs are only done in our neck of the woods on the weekends at this point, so we both look forward to them. Look, it's an angel bagel!!! Well, lets get onto some more interesting things, shall we? Yesterday, I took care of a very important errand, which ended up taking me just about all day. 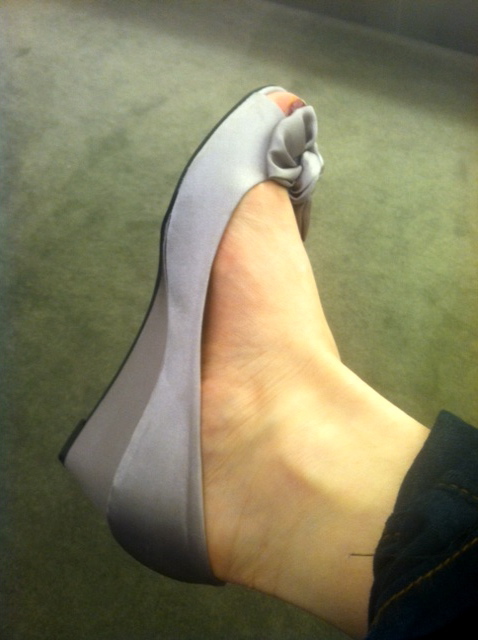 I headed off to DSW to see if I could find these shoes, which I have been eyeing for my bridesmaids. Unfortunately, they didn't have all of the sizes that we needed online, so I decided to try my luck at finding them in-store. I headed to the DSW in Schaumburg, which is HUGE, and searched up and down and up and down the aisles, with no luck. They didn't have those shoes - in fact, the didn't have ANY wedge occasion shoes. 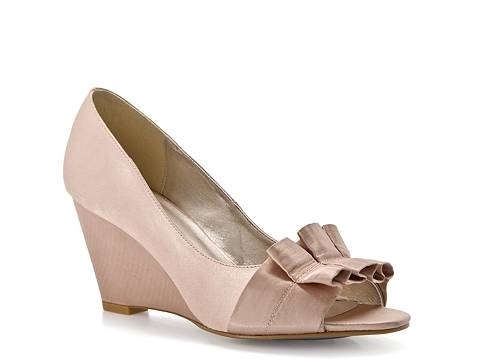 I really wanted wedges for my bridesmaids for the same reason I want them for myself - to make things more comfortable and safer since we are getting married on the golf course. There is nothing more unnerving that trying to walk on grass in a spiky-heel, especially when you have about 200 people looking at you while doing it. It would be a lot easier if we were getting married in the summer, because then I could justify some really cute flip flops or more casual wedge sandals - there were PLENTY of those at DSW. The dresses are a deep navy, which I think will be really pretty with a champagne/gold shoes and accessories, but this pewter color was also grabbing my attention. I didn't end up getting those shoes because they still felt too summery to me. But, now that I'm looking at them again, I kind of want to go back and get pair for myself. After going through the store for at least an hour, I decided to give up and head over to Woodfield Mall (which, by the way, could probably give the Mall of America a run for its money - it's HUGE). On the way out, I had to come back to look at some other sparkly sandals that were calling my name. Since my official wedding shoes are pretty high, I have been wanting to get a pair of more comfortable shoes to change into for later in the night. DSW actually has a great selection of "wedding" flip flops, if you're looking for some. I tried a bunch on before deciding on these Guess sandals because they were cute, comfortable, and still had a little bit of height to them so I won't be tripping over my dress (it will be hemmed based on my other shoes). I made sure the "Gs" were easily removable (they were). They weren't so bad, but that detail seemed a little chincy to me, so I went ahead and removed them when I got home. At least with that purchase, I didn't feel like my time at DSW was completely wasted, and I moved onto the mall. First stop was Nordstrom, where there were a couple of bridesmaid shoe contenders. 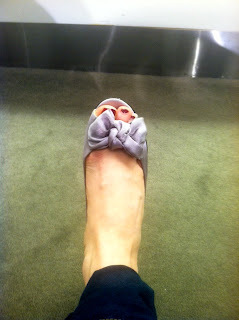 I loved these flats, but decided against them because I figured the girls would want at least a slight heel. Also, I tried them on and felt like I could ice skate across the floor - the bottom of the shoes were very "slippery" - which could be a recipe for disaster. I liked the shoe, but I wasn't sold on the color. Also, my toes felt pretty squished. Not terrible, but not exactly comfortable. I feel like they look super fancy from the front, and looking straight on, you can't even tell they are wedges. While I wished the gold material continued on to the heel, I did like that the heel wasn't cork or "espadrille" - it's a brown covered heel with a wood-like finish. I feel like that is at least a little more dressy. The kicker was that these shoes are SUPER comfortable. The front detail is all soft, real leather, and the heel is padded - so I am hoping the ladies will all be comfortable in the shoes throughout most of the event. 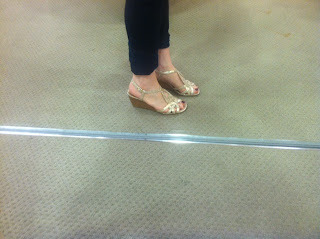 This was a really tough decision for me - as you know, there are not a lot of options for wedge occasion shoes out there. At least with these, while they could be a little more formal, I think the girls will be able to wear them on other occasions. I ended up getting the girls sizes and buying all of the shoes on the spot, because Macy's was (and still is) having a deal where if you buy 2+ pairs of shoes, you get all of the shoes at 25% off. That made this purchase really reasonable, so I felt good about it. So what do you guys think!?!?! Did I do well, or should I rethink this immediately? And now that this post took on a life of it's own - I gotta get movin'! Lots of grocery shopping and other Sunday things to do!